In addition, you need to dress for a wide range of activity levels, such as when you are exerting yourself and generating lots of body heat or when you are at rest and need to bundle up. The recommended approach for winter dressing is to add clothing layers when you get cold and take off layers when you start to sweat. Sweating should be avoided in winter because wet or damp clothing will chill you when you stop moving. Take off layers if you start to sweat or slow down your pace to generate less body heat. Important: Do not wear cotton on winter hikes because it takes so long to dry. The same holds for clothing made of wood fibers including modal, rayon, viscose, tencel, and lyocell. The following day winter day hiking clothing and gear will keep you safe and comfortable in below-treeline conditions. Below treeline hikes are usually protected by forest and are warmer and less windy than above-treeline hikes, which are on top of exposed mountains or ridgelines. Treeline occurs generally occurs at about 4300-4600 feet of elevation in the Northeastern United States. If you’re headed above treeline on a day hike, you’ll want to carry extra wind protection for your face and beefier traction aids, like full crampons. Avalanche tools are rarely needed in the Northeast unless you are hiking in high risk mountain areas. While gear lists are useful, I’ve also provided some advice below about what to look when purchasing gear for winter use to steer you in the right direction about the capabilities you want in winter hiking gear. Winter hiking boots should be rated for 20 below zero Fahrenheit or colder. Single layer insulated boots with the equivalent of 400 grams of Thinsulate insulation or the equivalent are sufficient for below treeline hiking, but some hiking leaders may require that you use an insulated mountaineering boot for above-treeline or long duration day hikes. It can be useful to size winter boots a half to a full size larger than normal to accommodate a thicker sock or sock liner without compromising blood circulation. Avoid so-called Pack Boots, which are less comfortable for vigorous hiking. Good insulated winter hiking bots include: Keen Summit County Boots, and Vasque Snowurban II Boots. Most hikers wear a heavier wool sock in winter than during other times of year, but this is an area of personal preference and the sock “systems” people use vary widely. Sock liners are optional but can be beneficial if you are blister prone. Whatever combination you use, make sure that there is plenty of space in your boots to wiggle you toes around as this increases blood circulation and foot warmth. REI makes excellent wool blend socks: REI Lightweight Merino Hiking Socks or REI Merino Wool Expedition Socks. High gaiters help prevent snow from entering your boots or making your socks wet. They also provide extra insulation below your knee. The most popular high gaiters worn by winter hikers are Outdoor Research Crocodile Gaiters. Avoid gaiters that close with zippers because they break quite quickly. Look for gaiters that seal around your leg using velcro instead. A minimum of two hats is recommended for winter day hikes: a lightweight wool or synthetic hat for high exertion activities and a warmer, heavier weight hat for later in the day when temperatures drop. The Mountain Hardware Micro Dome Beanie is a good lightweight fleece hat and the windproof Mountain Hardware Dome Perignon Beanie is a very warm hat, good when you’re feeling chilled at the end of the day. Many hikers also like to bring a neck gaiter, like a Polar Buff, which can be used as a scarf or another hat. A minimum of two pairs of gloves is recommended, although hikers often bring three or four pairs if their hands sweat a lot while hiking. One pair of gloves should be modular with an outer waterproof shell layer and an inner insulating liner. Mitts provide more warmth that gloves, but gloves provide more dexterity. One compromise approach is to use an insulating glove inside a waterproof shell mitt in order to provide dexterity and warmth. You can also bring multiple liner gloves and switch them out when they get damp and cold. Good modular gloves include: Outdoor Research Meteor Mitts or Outdoor Research Arete Gloves. The second pair of gloves is usually lighter weight and used while hiking when body movement will heat up your hands and keep them warmer. Softshell gloves are better than medium weight fleece gloves because snow sticks to them less and they are highly breathable. For example: Marmot Glide Softshell Gloves or Marmot Connect Gloves. Leather gloves absorb water and freeze and are not recommended. When you’re taking a break during a winter hike and have stopped moving, it’s best to pull a big puffy insulated jacket out of your backpack and wear it over your other clothes to stay warm. This coat should be sufficiently warm that you could stand around in it for a few hours, if someone in your group has an accident and you need to stay with them until help arrives. You want something with an integrated hood that will really keep you toasty warm in frigid weather. Good alternatives include the Montane Featherlight Down Jacket or the Western Mountaineering Meltdown Parka. Lighter weight insulated jackets like the Mountain Hardwear Hooded Down Ghost Whisperer are too lightweight and are more suitable as a mid-layer. You also want to carry a windproof and waterproof jacket with an integrated adjustable hood that can be worn while you are hiking. Called hard shell jackets or technical shell jackets, they don’t have built-in insulation, which would make you too warm. Instead, their purpose is it shield you from high winds and sustained rainfall, and to trap the heat held by your mid-layer garments. Look for jackets with at least two exterior pockets to stash hats and gloves. Hard shell jackets with pit zips provide the best breathability and venting. For example: the Outdoor Research Panorama Point Jacket or the Outdoor Research Foray are excellent options that I use in winter. Hard shell pants are completely windproof and waterproof. Many people find it helpful to use pants that have full zips along the sides to help vent extra heat while hiking and because you can put them on or take them off without having to take off your boots. Most hikers who wear hard shell pants as their primary pant layer also wear long underwear underneath them for warmth. Marmot Precip FZ Pants are an excellent, economical full zip waterproof pant option. There are a lot of options available for mid-layer insulation and it’s best to experiment a bit to figure out what you like best. 100 weight fleece jackets, pullovers, or vests are all cost-effective and well performing options, because fleece will keep you warm when it is wet and wick moisture away from your skin and base layers. The same holds for wool sweaters if you prefer it over fleece. You can also augment a mid-layer with a softshell jacket or a down or synthetic fill vest for more warmth depending on whether you run hot or cold. There are many manufacturers that sell fleece garments. Avoid carrying more than one mid-layer option at once however, because they add unnecessary weight to your backpack. Most winter hikers wear a wool or synthetic base layer consisting of a long sleeve jersey, long underwear, and some kind of boxer or bikini underwear under that. It’s important that all of your base layers by synthetic or wool and not cotton, because they’ll dry faster. The most important factor in choosing a base layer is that it should be wicking, so that it transports sweat away from your skin to the next highest layer of your clothing. Lightweight and thin layers do this better than heavier layers, but again this is an area of personal taste. Patagonia Capilene Lightweight, available in jerseys and long underwear, is an excellent option. A Smartwool Merino 150 LS Baselayer shirt is also an excellent option. It’s important to bring spare clothing (jersey, long underwear, socks) in case yours get wet, either from sweat, or because you’ve had some kind of accident, such as falling into a stream. This is fairly common when you have to do any stream crossing on a hike and a snow shelf you’re standing on collapses into the water. It’s also nice to have a dry layer to change into if you need to stop for an extended period of time and the clothes you are wearing are damp with sweat. The traction-aids that you bring on a hike are likely to vary, depending on the weather and whether you are hiking on a trail that others have hiked previously and packed down. Most hikers carry Kahtoola microspikes or Hillsound Trail Crampons on all hikes because they provide extra traction on packed snow and ice and they’re quite lightweight. Snowshoes may also be required, particularly on less traveled trails or after snowfall. When buying snowshoes for Northeast hiking you want ones that have a televator lift under the heel, which makes it easier to climb hills, and a binding system that you can adjust while wearing lightweight gloves. 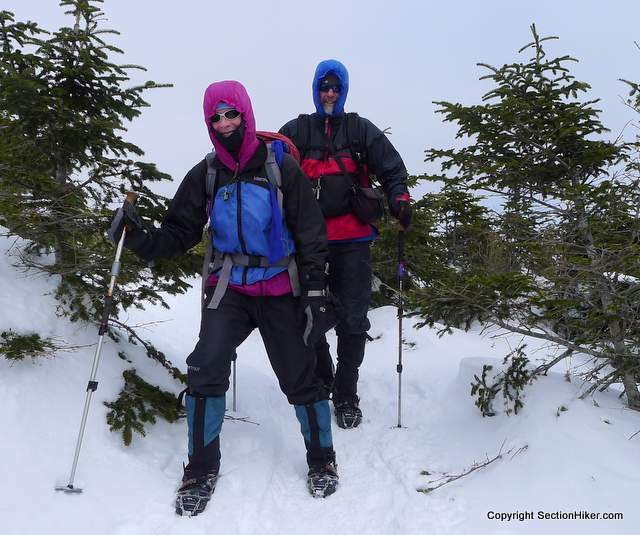 MSR and Tubbs snowshoes are used by most winter hikers. Hydration reservoir hoses freeze very easily in cold temperatures, so it’s best to carry two or three 1-liter wide-mouth bottles on winter hikes, since narrow mouth bottles also freeze shut more easily. If you carry your water bottles outside of your backpack, it’s best to store them in an insulated sleeve. White wide-mouth Nalgene bottles or Hunersdorf bottles are the best for winter use. For insulation, try insulated Nalgene water bottle sleeves or 40 below Bottle Boots. The 10 essentials are just as important in winter as during the rest of the year, perhaps more so, since winter hiking requires more self sufficiency. For an annotated list, see my 10 Essentials Guide. A map and compass are important because it’s easy to lose ones way, trail blazes are often buried in snow, and there are far fewer landmarks visible in winter when everything is covered in white. A plastic whistle is better than a metal one which will freeze to your lips, and useful if you get lost because it is louder than the human voice. You should use lithium batteries in your headlamp and other electronic devices because they are resistant to cold temperatures: nickel metal hydride and alkaline batteries drain much faster in cold weather. While you can buy commercial first aid, gear repair, and fire starting kits, there’s also easy to make by yourself at home. It also helps to being some kind of multi-tool or plastic ties with you on a winter hike to repair gear, especially traction-aids which take a lot of abuse. Sun protection, including sun glasses and sun screen are important to carry because it’s very easy to get a sunburn, from light reflected off the snow. If you’re winter day hiking alone, it’s important to bring extra insulation including a sleeping bag and sleeping pad in order to prevent hypothermia if you are immobilized and you need to survive until help arrives. A 20 degree sleeping bag, a foam accordion sleeping pad like a Therm-a-rest Zlite, and an lightweight bivy sack will usually suffice to keep it dry, if you put on all of the clothing you’re carrying. If you have to spend a unexpected night out, you also need to have some way of melting snow to create drinking water. While carrying a liquid fuel stove like a MSR Whisperlite and a cook pot is the most reliable way of doing this, you can also carry several ESBIT cubes, a solid fuel, and a small metal cup to melt water in an emergency. Hypothermia is accelerated by dehydration and can have dire consequences. When hiking in a group, this gear is usually distributed between group members, otherwise you’ll probably need a bigger backpack to carry it all. For above treeline hiking, your biggest priorities are extra wind protection for your face and extra traction to prevent uncontrolled slides on ice and snow. The easiest way to protect your face is to use a balaclava with a fully integrated facemask like the Serius Comboclava. You’ll need to combine that with ski goggles to protect your eyes from blowing snow and to prevent them from freezing shut. You’ll also want a pair of ski goggles to protect your eyes from blowing snow and sun glare. For extra traction, you’ll want to buy toothier crampons and an ice axe. This is a fairly advanced stage of winter day hiking, so its best to learn how to use these tools from a qualified instructor, either a mountaineering guide, or in one of the winter hiking schools run by outdoor clubs in the northeast. 1) Ear Muffs (360 brand) – I fiind keeping the ears covered lets my head be a radiator for excess heat (I run hot). In wind, I use the hood of my wind proof layer above tree line with the ear muffs underneath. I carry a warm hat in case we have to stop moving. 2) I wear Smartwool liner gloves under the OR Meteor Mitts – this lets me open the mitts pull. back thumb and fingers, get great dexterity, without exposing fingers directly to the cold. Great for using a camera or eating some food. Great advice bill. I use fleece and wool gloves under mitten shells all the time. The extra dexterity os so worth it. I noticed that OR even includes glove primaloft liners on some of their high end mitten shells too. These VBL sox will last years and all you need are an extra pair of thin poly liners for each day you will be camping. (Stanky, sweaty liner socks go in a Ziplock quart freezer bag, Tightly sealed!) At night in your tent remove sox and sock liners, turn sox inside-out to dry for 20 minutes then place in foot of sleeping bag to be warm for the morning. The US Divers 3 mm sox are factory seam sealed and have Right and Left shaped sox. I have used this arrangement for two decades and it works very well, far better than commercial sealed ripstop VBL sox. My first use was with my Sorel felt pacs to keep the felt liners dry. Then I used it in XC ski boots, backcountry ski boots and GTX hiking boots. One other item to consider for winter hiking is a Bothy Bag, a UK import made by Terra Nova Equipment (12.5 oz, in a stuff sack that measures 11” long x 5” diameter). My wife and I carry one on all of our winter day hikes and use it for both lunch and snack breaks if the weather is foul The Bothy 2 is a cozy fit for two (there are sizes up to Bothy 8), and sitting together quickly warms the air inside the coated nylon shell while a small vent keeps the air reasonably fresh and reduces condensation. We’ll sit on a half foam pad with the bottom Bothy edges tucked under the pad to keep us dry and warm, even in freezing rain. It wouldn’t be a fun night if we had to bivouac, but a combination of down jackets and other carried insulation should make it fairly safe, though I haven’t tested that yet. Just received an Eddie Bauer PEAK XV fully baffled down parka today. Yes, it’s too warm for temps above 15 F. when you are moving at a moderate pace. But for frigid days down to -40 F. it will be just right. Below -40 F. I’ll be sitting beside the fire. This is a parka made for extreme conditions that I see when winter ski camping or alpine skiing. It’s also nice for cold days sitting on a stand waiting for coyotes coming in to my calls. Those are hard shell pants. They’re called snow pants, but they’re made with waterproof breathable and uninsulated fabric. The only difference between them and rain pants is the built in protective patch at the ankle which you’ll find annoying for winter hiking. What were you thinking about wearing under the TNF snow pants for insulation? I’d recommend something that will let you take off the snow pants completely, like actual pants. The reason I suggest full length side zippers, besides venting, is so you can take the pants off or put them on again without taking off your boots. If they’re backpacking or winter hiking I’d really advise a hard shell in that mix and lots of thin layers rather than heavy ones. Not sure what jogging or snow pants are without specifics, but they sound too warm. Do they know how to layer and delayer to avoid sweating? If you’re dressing them, it sounds like they have zero winter experience. If they have a guide, I’d contact them for their feedback. Especially regarding gloves, footwear, and headwear which you haven’t listed. I am planning to go to Yosemite by the end of march and this will be my first time hiking in winter’s conditions ( i used to week hikes once/twice a year in high altitude ( over 6000 to 9000 ft) but during summer. I will do only daily trails from 2-3 to 5-6 hours and hotel nights. – i got walking boots (french – decathlon forclaz 600 men) adapt for high mountain and all weather. there really efficient to keep me dry, but do you think inside thermal insoles and good socks will be enough to keep me warm. Do you think this is enough? Do i need to change the base layer for merino’s one? Sounds like you’re a fairly experienced hiker. I suggest you bring everything and try different combinations on short trips to dial in your system. No one can tell you for certain what the weather will be like at that time of year, so be prepared for anything. You’re staying nights in a hotel so you can pack heavy. And also thanks for the article, i’ve learned few tips on those pages.